HOUSTON – March 7, 2018 – The Lake Houston Sports and Recreation Foundation, a 501c3 non-profit organization that was founded to support the improvement of Lake Houston, announced today that ZEBCO Brands, a leader in the fishing tackle industry, will serve as the foundation’s 2018 Platinum Sponsor. The sponsorship will be used to help increase public awareness of Lake Houston through increased marketing assistance, as well as provide fishing rods and reel combos for children who participate in the Foundation’s “Take a Kid Fishing Day” on Saturday, April 7th, 2018 at Cedar Landing Marina, 10614 FM 1960 East, Huffman, Texas 77336. Lake Houston, which is located 15 miles northeast of Houston in Harris County, is a major municipal water supply for the city of Houston. In August 2017, Hurricane Harvey, a Category 4 storm, hit Texas and caused catastrophic rainfall resulting in widespread damage to Lake Houston and surrounding communities. Multiple news sources are estimating damage to Houston in excess of $125 billion. More than 60 inches of rain fell during the hurricane, making it the highest rainfall amounts since records began being kept in the 1880s. As the Platinum Sponsor of the Lake Houston Sports and Recreation Foundation, Zebco joins a list of other respected corporate sponsors including Ambit Energy, Constellation Energy, Crius Energy, Engie, Hudson Energy, The Dock Line, TXU and Unified Energy, among others. The corporate sponsorships support the LHSRF’s efforts on capital improvement and damage repair projects around the lake, as well as supplement the foundation’s efforts to create a stocking program and preserve the lake’s native habitat. Companies that are interested in sponsoring the efforts to help the Lake Houston Sports and Recreation Foundation rebuild and preserve Lake Houston should contact David Otis at david@texasshoreline.com or 713-410-1691. The Lake Houston Sports and Recreation Foundation was formed from members of the community who are interested in the improvement of Lake Houston. The Lake Houston Sports and Recreation Foundation is a 501c3 non-profit organization with the goal of increasing public awareness of the benefits of a major lake in our community, create a stocking program, improving habitat and other improvement projects on and around the lake. 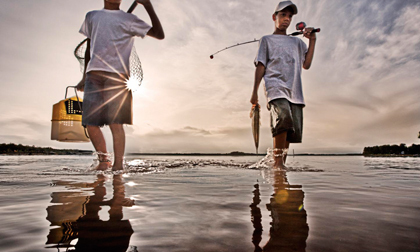 The mission of The Lake Houston Sports and Recreation Foundation is to increase public awareness of the value of having a major lake (Lake Houston) in the community by hosting several fundraising events with proceeds benefit the fishery, habitat and other various Lake Houston projects. Zebco Brands, (www.zebco.com) based in Tulsa, Oklahoma, is a leading marketer of fishing tackle and outdoor gear sold under a portfolio of brand names. The ZEBCO, Rhino, and Martin brands compete in recreational freshwater rods and reels, The Quantum, Fin-Nor, and Van Staal brands are targeted at avid fishermen from freshwater to offshore saltwater. The Cajun line brand competes in fishing line while the Badlands brand provides serious packs and outdoor garments for hunting. ZEBCO has been in the fishing business since 1949 and was acquired by the W.C. Bradley Company in 2001. The W.C. Bradley Company, founded in 1885, is a privately-owned company headquartered in Columbus, Georgia. It is a multi-brand marketer of high-quality consumer goods and services focused primarily on the home and leisure lifestyle markets.